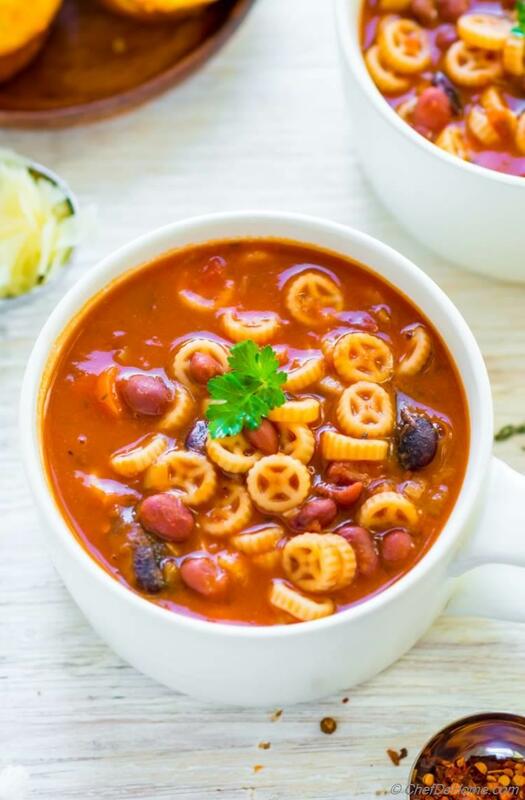 Creamy without creams with three kind of beans, pasta, and flavorful tomato and herbs broth.. this soup has all you need for a comforting winter dinner! 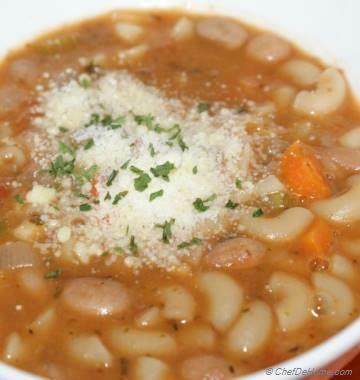 Pasta e Fagioli - The best ever Pasta and Beans soup which will make you feel like dinning in an Italian Bistro! 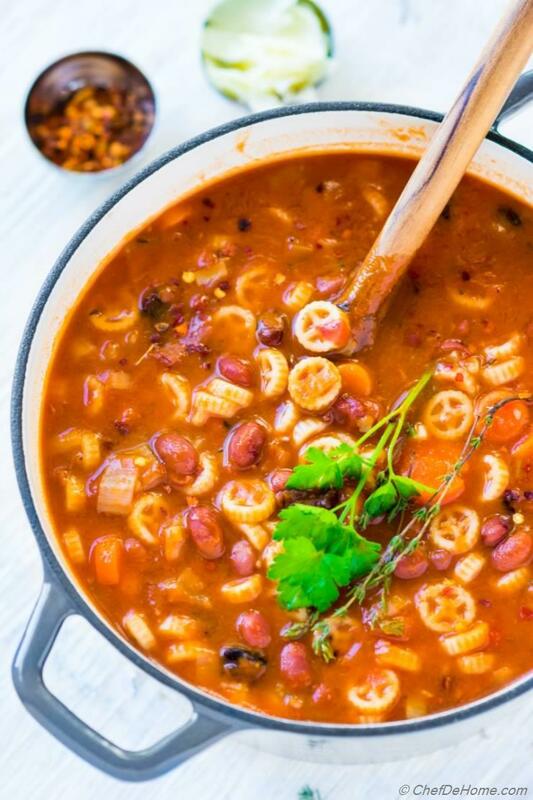 Pasta e Fagioli, a hearty one pot pasta and beans dinner soup made with small pasta, aromatics and three kinds of beans simmered in flavorful Italian-style tomato broth. Since pasta is cooked in the same broth, this soup is naturally creamy and stick-to-ribs comforting without any cream or thickeners. 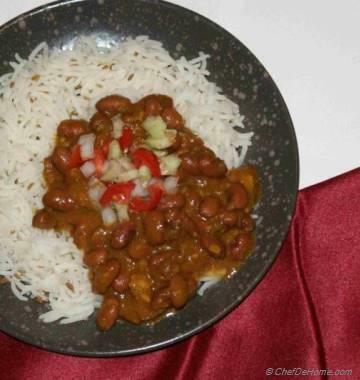 For this recipe, I used three kind of beans - red kidney beans, cannellini beans and lime beans. Whenever I prepare beans soup, I like to start from scratch with fresh beans soaked overnight. However, once beans are cooked, the rest of soup preparation is same for canned or fresh beans. So you can use same recipe with canned kidney and cannellini beans. I decided to start year with Pasta e Fagioli because this is one of the first soups I shared on my blog 5 years ago. When I first shared Pasta Fagioli recipe, I added lots of celery, carrot, onions and bay leaves to the soup because I wanted add few servings of veggies in the soup. I remember, one of my follower went curious debating the traditional Italian pasta fagioli does not have carrots or onions in the soup. Well, my idea of adding veggies is always to sneak in vegetables in our diet and not to comete with traditional versions. :) Plus it helps develop flavor too! So, I still like to add mirapoix of celery, carrots and onions to build a flavorful base for fagioli soup. 1) Pureed Tomatoes: I puree tomatoes before adding to soup because my better-half is not so fan of chunky tomatoes in pasta fagioli soup. So I prefer to puree or use already pureed ones. 2) Chunky Beans: I don't puree the beans. Instead let them simmer little longer and mash a little with back of spatula. This gives creamy texture to the soup without need of extra steps. Last weekend when I made Pasta Fagioli again... I decided to share version-2 with you all. This time, I have used all surplus beans from my pantry and soaked them overnight. In morning I pressure cook them in 20 minutes before preparing soup. Don't worry if you don't own a pressure cooker. You can simply boil the beans in fresh water and salt until these are tender. Lima beans take little more time to cook than other small beans. So if you are time pressed, use only kidney beans and cannellini beans. Or skip pre-soaking beans and use one can of low sodium kidney beans and cannellini beans. Once the beans are ready, pasta fagioli comes together in no time. Like I said, this is a kinda soup which is comforting, thick and creamy without any cream. The small pasta (I used pin wheels) is cooked with the soup broth and little starch of pasta makes soup creamy along with creaminess of beans. In just 25 minutes you will have a pot full of the best pasta and beans dinner ever! 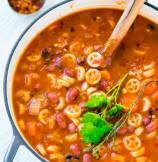 I would say for first time, try this soup today with whatever canned beans you have in pantry. Just try it! You will know what I'm talking about. This soup has potential to make a lite weeknight winter dinner feeling like amazing Holiday Supper! Only without the load of calories! Note: Soup is vegan if you don't serve with parmesan cheese. This New Year we are all set to healthy yet flavorful! Don't we? 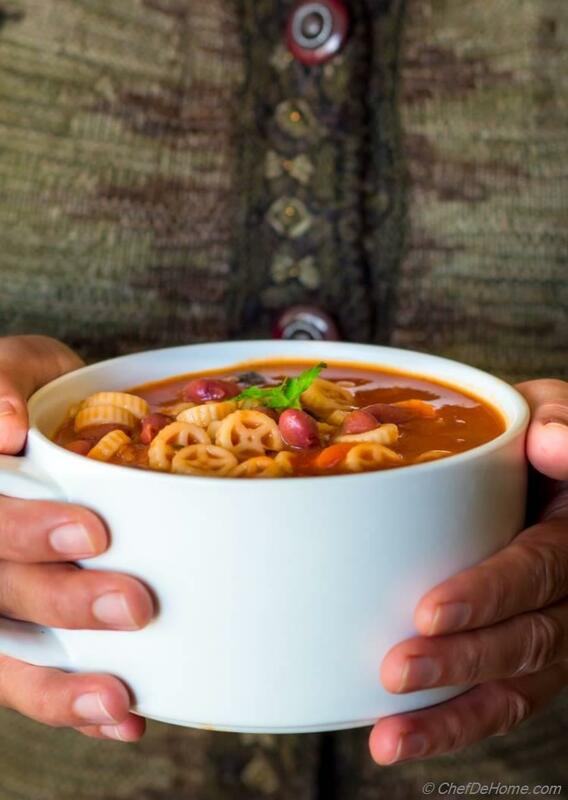 Why don't start with an amazing bowl of Pasta e Fagioli!! Wish you all a wonderful year 2017! 1. If using fresh beans. Soak them overnight. Drain and boil with salt until tender. I like to pressure cook them to get ready in 20 minutes. 3. 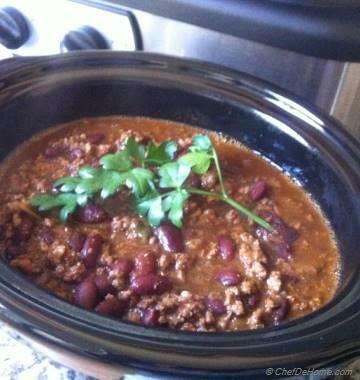 Add chili flakes, tomatoes, pasta, cooked beans with 1/2 tsp of salt. Mix well. Bring to boil and simmer covered for 20 minutes. Discard the thyme sprigs, mix in vinegar. Taste and adjust salt. 4. Ladle soup in cups. Serve hot with a crusty bread. Enjoy! For more rustic flavor, you can also sprinkle some parmesan cheese on top (not vegan). This was very good! We'll be making it again! Thanks! Hi Renee, I'm glad you enjoyed. I don't know what part of Italy you come from, but my grandmother never used kidney beans. she used white cannelini beans. and the vegetables should be finely chopped. Hello Joe, I'm sure your grandma made amazing fagioli soup. This is just my take on soup with three kind of beans, one of which is cannellini beans. In-fact, I use all kind of beans in this soup. You can chop veggies as per your preference. Savita this looks amazing and count me in for nourishing bowl of soup that is delicious too! Can't wait to try this! can't wait to try this!! thanks for sharing! I'm happy to share, Shelly! I hope you like it when you try. Hi Savita, this soup looks so tempting! I'm trying it tonight. How much will be the ratio of three beans? I'm thinking to use red beans, chickpeas and black eyed peas. I only have these at home :) thanks! Hi Neeli, thanks my friend! Soup is actually very delicious. I'm sure you will love it. For ratio of beans, I used 2/3 cup of red kidney beans and 1/2 cup of cannellini and about 1/3 cup lima. It is totally up to you what quantity of beans you want to use. I would suggest using 1/2 cup of each - red, chickpea and black eyed peas. I hope it helps.